Glasgow Airport has announced that it has increased its recycling rate to over 90 per cent, following the implementation of Zero Waste Scotland’s Resource Efficiency Pledge. The scheme, coordinated by Resource Efficient Scotland (a programme of Zero Waste Scotland), asks businesses to ‘commit to reducing their impact on the environment by making better use of energy, water and raw materials’. As part of the initiative, Glasgow Airport introduced a new recycling scheme involving the distribution of double bins throughout the terminal, to allow staff and passengers to separate general waste from recycling. This has been accompanied by ‘targeted staff awareness training’, which has reportedly helped simultaneously boost recycling levels and reduce the contamination of recycling bins, resulting in savings in excess of £8,000 per year. In addition, the airport introduced a number of other green initiatives, such as the installation of new, energy-efficient vending machines and lighting, and improvements to the airport’s air conditioning systems. Businesses within the terminal building, including Boots the Chemist, JD Wetherspoons, Delware North, World Duty Free and Discover Glasgow have now also made a Resource Efficiency Pledge, which the airport has supported with the launch of a new set of ‘Golden Rules’ and by instilling a ‘waste-aware culture’. Glasgow Airport claims that this has resulted in ‘significant improvements in waste collection and general service yard cleanliness’. Vicky McDowell, Glasgow Airport’s Commercial Manager, added: “We are very proud of our achievements and of how our business partners came together to achieve this mutual goal. In late 2014 we formed an action group involving all our retailers to develop a charter, which became known as Keep It Clean Behind The Scenes. 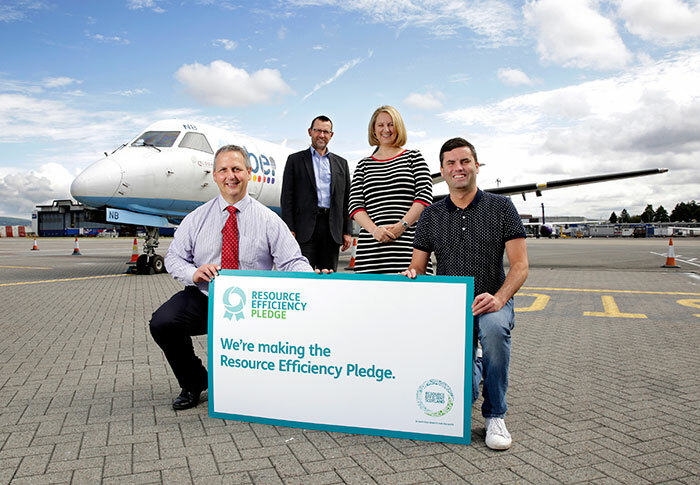 Find out more about the Resource Efficiency Pledge. Zero Waste Scotland calls on Scottish businesses to take up resource efficient measures through a Resource Efficiency Pledge. Managed IT Experts has become the first organisation in Scotland to achieve a Bronze Resource Efficiency Pledge certificate.